1. We meet the social-emotional needs of all students, putting Maslow’s Hierarchy of Needs before Bloom’s Taxonomy. 2. We believe learning growth matters most, requires risk-taking, and the work we do in our schools has the greatest impact on this. 3. We’re future-focused, believing the development of certain traits and skills will best prepare our students for ever-changing careers. 4. We emphasize what is good for kids over the needs and comfort of adults. Harrison 8th graders instruct schoolmates in Junior Achievement standards. Some fine things have been happening at Harrison K-8. Two weeks ago Harrison Counselor Rodney Pacheco organized a Junior Achievement in a day event on the campus. 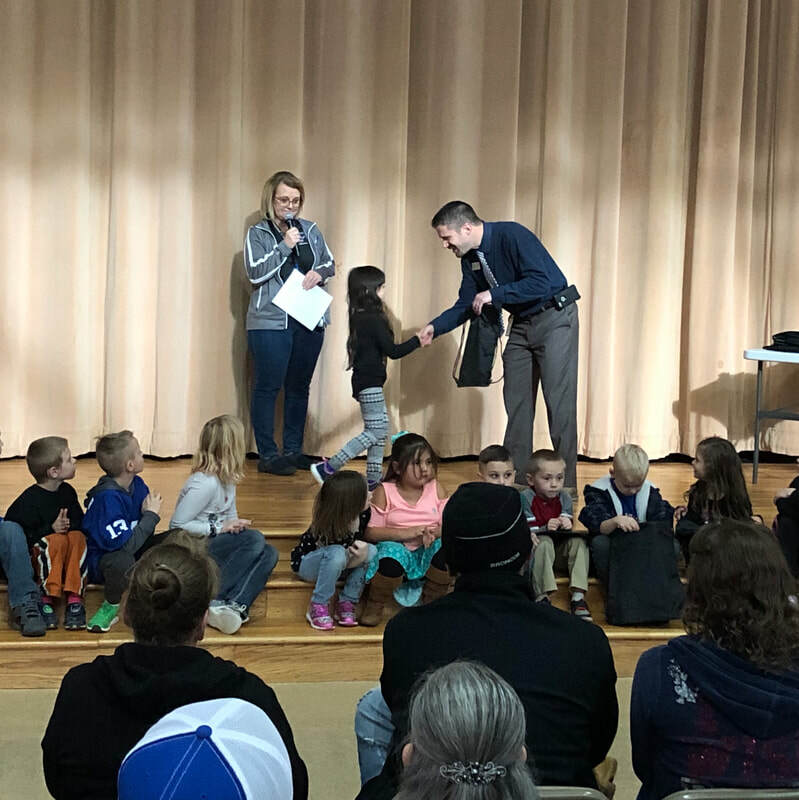 As part of this program, Cañon City High School National Honor Society members instructed some of our youngest students. On the same day, a group of Harrison 8th Graders pitched in to teach Junior Achievement lessons to their younger schoolmates. Then just this week, Harrison hosted a school-wide assembly to honor its January Hawks of the month. Mrs. Autobee and Mr. Olguin honor a Falcon of the Month. Mrs. Davidson endures being taped to the wall by outstanding CCMS fund raisers. Mr. Daly shows his best poker face at a CCMS after school board game session. A bunch of fun things have been happening recently at Cañon City Middle School as well. Last week Language Arts Teacher Sheri Davidson was taped to a wall by students thanks to success they displayed on a recent schoolwide fundraiser. 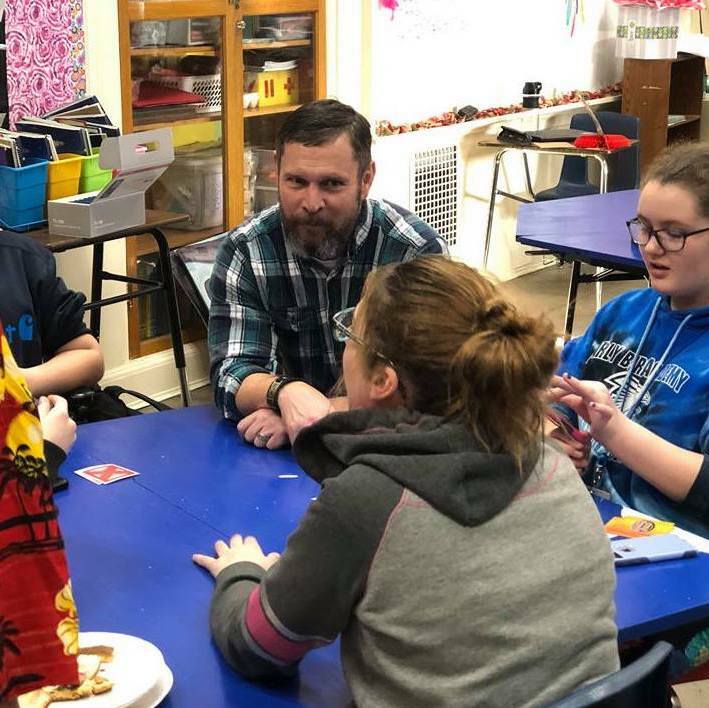 Additionally, CCMS staff have made it common practice to stay after school to play board games with students, and based on the images I've seen, this has been quite a popular activity for adults and children. What a great way to connect with kids! Calendar Committee members study several proposed options. During our Superintendent Advisory Council meeting this week we worked on 2019-20 projected school enrollments and worked on recommended staffing allocations for each building. These will be discussed at Monday's Board of Education meeting and released building leaders as soon as possible. We made significant progress during our district calendar committee meeting last Wednesday. As a result of our work, we agreed to continue working toward a proposal that adheres to these interests: Not significantly lengthening the typical school day, offering more professional development time for teachers, including at least one and a half teacher workdays prior to the start of school, not significantly extending the start and end dates of the school year, balancing the length of quarters and semesters as much a possible, offering both 4 and 5 day school weeks in a consistent and predictable manner throughout the school year, keeping in mind the needs of our Nutrition Services Department in terms of the number of days we're in school prior to October 1st (for free and Reduced Lunch count related to per-pupil funding) and the impact our calendar will have both on department meal sales revenues and staff compensation. The committee was somewhat in disagreement about these issues: Whether professional development days should be full days, half-day in length with no school at all, half-day mornings with school in the afternoon, or half-day afternoons with school in the morning, whether shortened weeks should leverage Mondays or Fridays off, and whether we should aim for a calendar at or above the CDE threshold of 160 days to avoid, or attain, official designation as a 4-day school week district. At the end of our meeting, we formed committees to prepare and present straw designs in time for our next gathering on Tuesday, January 29th. One committee will create a calendar option that incorporates all our above agreements, shortens weeks by having no school Mondays, and advocates for specific provisions from the areas we could not yet reach an agreement. A second committee will create a calendar that incorporates all our above agreements, shortens weeks by having no school on Fridays, and also advocates for specific provisions from the areas we could not reach an agreement. We had a quorum available for Thursday's special board meeting to approve an athletic trip out of state. There was no school on Monday, January 21st in celebration of Martin Luther King Day. On Tuesday I started my day with a networking meeting, followed by a Superintendent Advisory Council meeting, and an Instructional Leader Professional Learning Community gathering. On Wednesday I participated in an Opportunity Coalition legislative advocacy call, a series of meetings related to personnel and staffing matters, and an expulsion hearing. I ended that day guiding the work of our district calendar committee. On Thursday I had a touching base session with Brian Turner of SolVista, a touching base meeting board president Larry Oddo, and a special board meeting to approve an out of state wrestling trip. On Friday I spent the day in Denver working on legislative advocacy. We'll have a visit this week by Deci Douroux, one of our Lindamood-Bell support Partners. She'll be observing the progress we're making through our targeted reading intervention processes. On Monday I have a series of routine meetings, expulsion hearing, a board work session, and a board meeting. On Tuesday I'll join in on a Rural Alliance legislative video call, I'll touch base with new Pueblo Community College-Fremont Campus Dean Linda Stetter, attend a Superintendent Advisory Council meeting, and facilitate our next Calendar Committee meeting. On Wednesday I'll be focusing on preparation work for our Assistant Superintendent of Schools and Director evaluations. Assistant Superintendent of Schools Adam Hartman and I will then make our way to Denver to join CCHS Principal Bill Summers and a team of high school staff for the next Colorado Education Initiative Assessment for Learning Project meeting on Thursday. 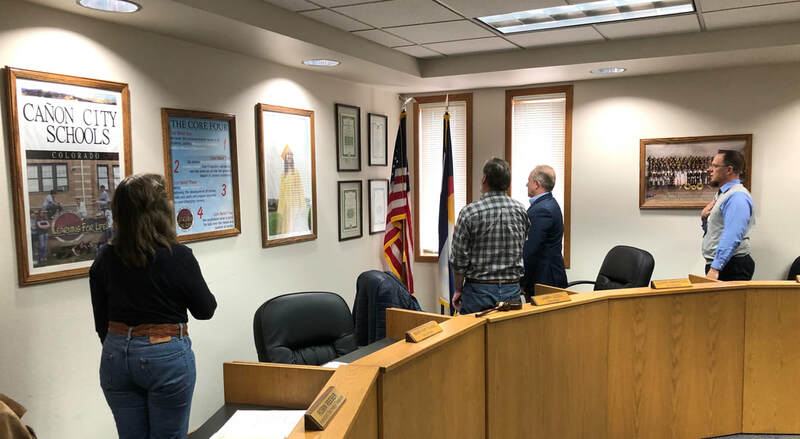 We'll then proceed to Longmont on Friday to join our Board of Education for a CEI Breakthrough District Governance Team session on that takes place all day Friday and Saturday morning. As part of our annual process to evaluate the performance of the superintendent of schools we're asking you to take a moment of your time, probably around 10 minutes, to complete the attached survey. This survey is designed to measure your perception of Mr. Welsh's performance in all the roles we have outlined for him as our chief executive officer. We realize you may feel there are areas where you just don't have enough information to rate Mr. Welsh. If that is the case we encourage you to simply respond "I don't know" on those questions. Most importantly, we would appreciate if you could advise us about things you think Mr. Welsh does well, in addition to anything you would like him to do differently in the future. If you complete and submit this survey by the end of the day Friday, February 1st, we'll take your opinion into account as we compile his final evaluation. It is our hope we'll have a high number of responses as this is your best opportunity to let us know how you feel things are going.
. . . and thanks for listening once again!